The Historic Dockyard, Chatham, on the River Medway in Kent must surely be one of the most extraordinary places in the U.K. and, I’m ashamed to say, I scarcely knew it existed. It had been a Royal Naval Dockyard since Henry VIII’s time; the diarist, Samuel Pepys, in his capacity as Clerk of the King’s Ships visited regularly in the 1660s. Charles Dickens’ father worked in the Cashiers’ Office here from 1817-22. At least I’d heard of the Dockyard’s famous ropewalk – over a quarter of a mile long, and still in operation. 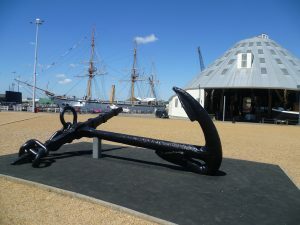 What’s more, the dockyard is only forty minutes by fast train from London, so I had no excuse not to visit. 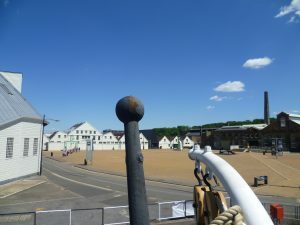 The first thing that struck me was the dockyard’s sheer scale – it covers 400 acres and there are over a hundred important buildings and structures, including forty-seven scheduled Ancient Monuments. The dockyard only closed in 1984 and its history seems ever present. I saw at once that I could only see a fraction of what was there in the time I had, and decided to concentrate on the early stuff, which is my area of interest. Another visitor with different interests would have chosen to see different things and had a completely different experience. This Covered Slip (top right) from 1838 may look like a mushroom but it was revolutionary in its day. The covered slip is one of five huge buildings built of timber with cantilever frames which allowed them to accommodate a sailing ship’s bow. The slip itself was made of granite. The roofed space also protected the ship’s hull from dry rot. Originally, the roof was made of tarred paper! It now has a zinc roof. 3 Slip, shown above, is an extremely rare survival. Nowadays, it houses some of the heavy cannons like the ones above. 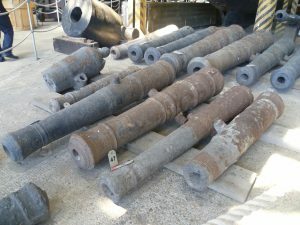 I wouldn’t want to have been a powder monkey responsible for carrying the gunpowder to these brutes. Too much gunpowder and one stray spark could be a fatal combination, and the poor lads were often as young as eleven or twelve. Their job was one of the most dangerous in the Navy. H.M.S. Cavalier, launched in 1944 is a CA-class destroyer and saw active service during World War II. The past mingles with the present everywhere. 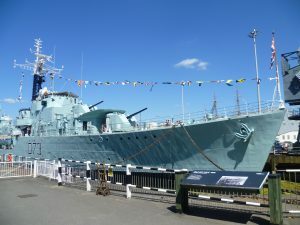 There is a plaque in front of what is now the Victory dry dock, saying that H.M.S. Victory had moored there on bringing Nelson’s body home after the Battle of Trafalgar in 1805. Nowadays, H.M.S. Cavalier, a 1944 destroyer, rests here. A naval dockyard of national importance was always going to need suitable housing and offices for staff and workers. The dry docks, the covered slips, the ropery and so on are all exactly where they need to be, as are the administrative blocks, like the one above. Renamed the Admiral’s Office, it eventually became the office for the Port Admiral and it adapted itself to its new circumstances. 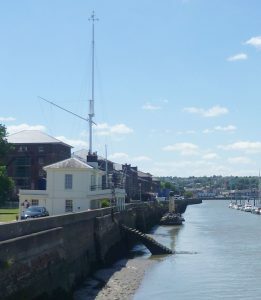 No Commissioner, responsible for the running of the dockyard, felt the need to pull it down and rebuild it; and no 1960s high rise tower blocks were constructed in Chatham Dockyard. The Cashiers’ Office, where Dickens’ father worked is still there. It struck me more than once that if Dickens, who knew Chatham well as a child, returned, he’d have no difficulty in finding his way around. H.M.S. Gannet (1878) looking out over Museum Square. Visitors can go aboard H.M.S. Gannet and I did so. She was a sloop propelled by both sail and steam, and she saw service in the South Pacific, the Mediterranean, and the Red Sea. There is a good view from the deck over Museum Square. In the photo above you can see a bit of Slip no 3 on the left, and the Mast Houses and Mould Loft in the background. 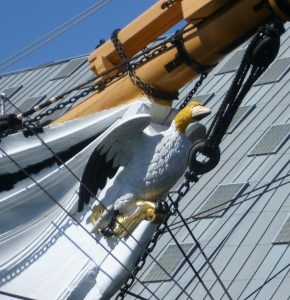 H.M.S Gannet’s figurehead is, naturally, a gannet. Ship-building required a large workforce skilled in dealing with storing and seasoning timber, for example – so timber for masts, often 90ft tall, had to be stored in the suitably tall Mast Houses. The moulds, or templates, of the curved wooden hulls, also needed a lot of floor space – and so the Mould Loft was built. There is a terrific laser images tour telling the story of a young lad who longs to go to sea trying to put his case to his reluctant grandfather. The buildings are wonderful to walk round – all wood and immensely impressive, particularly the Mould Loft – and you can see exactly how a ship’s architect could draw out an accurate plan for a sailing ship’s hull on the floor of the Mould Loft. But, because of the laser images, the lighting has to be low and photographs just don’t work here. So I can tell you about it but, alas, I can’t show you. This small railway engine, Ajax, brought coal into the dockyard. 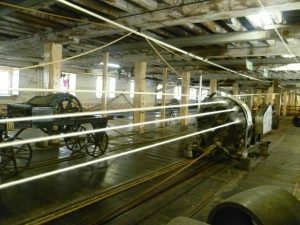 The dockyard also had a large Smithery, a wheelwright’s shop – which included capstan-makers and pump makers; a sails and colours loft, and, later on, a railway workshop – each steam-driven tea ship needed twenty-one waggons full of coal for a single voyage. 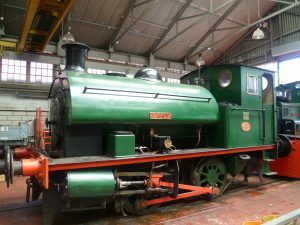 The Ajax, above, reminded me of Thomas the Tank Engine, and, like Thomas, was a ‘really useful engine’. The dockyard was at the forefront of technological change and adapted to the needs of steam, steel and submarine, when they appeared. Everything needed to be ship-shape and to hand – and it was. The Ropery – the outside wall. The Rope Walk is a quarter of a mile long. 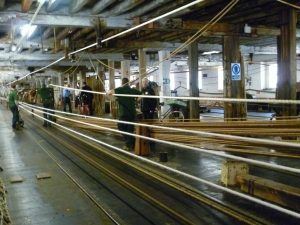 Seeing how rope is made in the only working rope walk in the world is absolutely not to be missed – and I booked to see it as soon as I arrived. 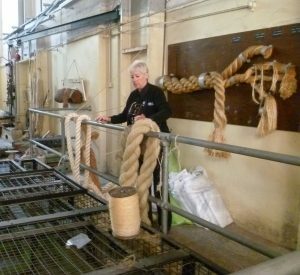 Master Ropemakers Ltd still makes and sells rope here commercially. The importance of rope to the dockyard cannot be underestimated; the rigging on a single sailing ship like Nelson’s Victory needed about thirty-one miles of rope. Teresa Dench was our friendly and knowledgeable guide. First of all she showed us the different yarns rope could be made from: coir, hemp, manila, sisal and, more recently, synthetics. Hemp, she said, doesn’t stretch – which is why the hangman’s noose was always made of hemp. I found myself swallowing uneasily. Coir is often used to make floats to stop boats rubbing together or banging against harbour walls. The Ropery is so long, you can’t see the end. Ship’s rope, however, is made from a fibrous palm tree which grows in the Philippines, and the Navy named it ‘manila’ because Manila (its capital), is where they had to go to get it. We moved into the Rope Walk itself which was built in brick in 1778 at George III’s instigation. The original timber building dated back to 1618. Getting ready; the three lowest ropes will be twisted into one rope. We were going to be shown three thinnish ropes being twisted together into one much bigger rope. Originally, this would have been done by hand and it would have needed over 200 hundred men to make a cable with a 20 inch circumference. They must have been immensely strong and the job sounds absolutely exhausting. Steam power was introduced in 1836 and electricity in the early 20th century. The machine trundling towards us. Even though I watched it happen, and even though Teresa’s explanations were exemplary, and I assure you that, at the time, I knew exactly how it worked, nevertheless, I find it impossible to explain with any clarity. The Rope Walk is a darkish space, which doesn’t help. Suffice it to say that it was noisy and an awe-inspiring sight and that, even though it was now powered by electricity, there was obviously a lot of skill involved, too. And it took its time. 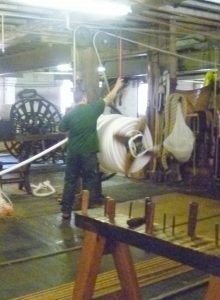 When the job was done, the new much thicker rope was cut free and taken to be coiled onto a huge bobbin before being packed for storage – and, eventually, sold. I have nothing but respect for the men who worked there. I am ending with this charming small house built in 1756, one of the earliest buildings in the dockyard. 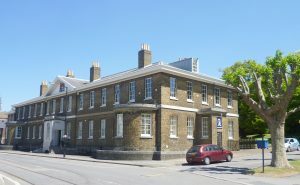 It was originally built as an office for the Dockyard’s two Master Attendants who were responsible for all the warships in the Medway, either moored, in reserve, or awaiting repairs. I love the fact that the building is still here. 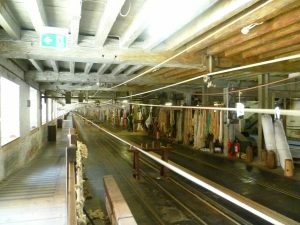 I shall definitely be visiting Chatham Historic Dockyard again, and this time, I’ll see all the things I didn’t have time to see first time round. 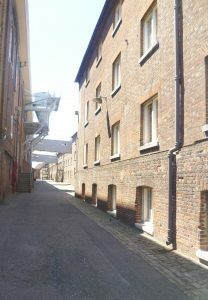 And Chatham itself, not just the dockyard, has been used as a backdrop in many TV dramas set in the recent past. Call the Midwife for one. You are right, Gilli – and thank you for dropping by. All those Medway towns are full of historical interest – Rochester for one. Thank you for this fascinating post. I learned so many neat pieces of trivia…. Thank you, Vicki. I’m glad you enjoyed the post. I’m not sure about the ‘neat pieces of trivia’, though! But you are probably right; I chose to do a shallow haul through a very large sea rather than going into depth about a single topic. But a blog is a curious thing. It is not the same as an academic essay (and I’ve written many of those) and it has its own rules; the first one of which is to engage the reader and keep him/her interested and amused. “a shallow haul through a very large sea” certainly entertained me! Thank you. This post puts me in mind of historically fictitious stalwarts Lucky Jack Aubrey and Stephen Maturin, and to a lesser extent that other Horatio – all of whom would be likely to haunt these precincts while ashore. 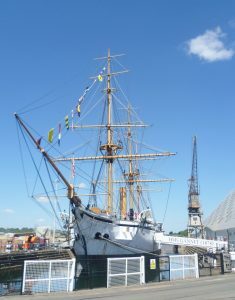 And in your wheelhouse, Elizabeth, I found: http://www.oldsaltblog.com/2012/08/timbers-from-jane-austens-brothers-ship-hms-namur-found-under-floorboards-at-chatham-historic-dockyard/ Fair Winds and Following Seas to you. Thank you for your interesting comment, Steve – and for the website link. The timbers of the Namur (1756) discovered under the floorboards in the Upper Mast House is a fascinating archaeological discovery – and it has a moving human story to tell, too. Fair Winds and a Prosperous voyage to you, too. A Ship of the Line of so many years of service (nearly eighty!) is bound to harbour many compelling stories. Do you refer to the autobiography of Olaudah Equiano? I should have mentioned, perhaps, that the Black abolitionist, Olaudah Equiano, had sailed on the Namur as a powder-monkey; and that Charles Austen, one of Jane Austen’s brothers had later been her captain. Unfortunately, my photos of a lot of higgledy-piggledy ship’s timbers were not very exciting, and I felt that Olaudah Equiano’s story deserved more space than I could give it. Well, that’s a recommendation for further reading if ever I saw one. I’ll have to give “The Interesting Narrative of the Life Of Olaudah Equiano” some attention. But first I’ll finish up John Masefield’s “The Midnight Folk” – a charming story and influential, I think, to T.H. White’s first Arthur novel.